On The Wall Gallery presents a Objects of Abstraction at the newly re-opened Grove Gallery at the Limegrove Lifestyle Centre. 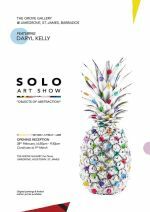 Objects of Abstraction is a Solo Art Show showcasing the work of Daryl Kelly. On The Wall Gallery has three locations in Barbados. Above Champers Restaurant, Christ Church, in the Earth Works Plaza in St.Thomas, and its newest location, Limegrove Lifestyle Centre in Holetown, St. James. They showcase a stable of 15 local artist, of varying styles and mediums, many of whom have shown their work internationally to high acclaim. The craft and jewellery are hand made and unique and their mission is to always dedicate space to well designed and executed artwork that resonates the lifestyle and colours of the Caribbean. They are able to arrange commissions and ship internationally.